The 1911 is one of the most instantly recognisable pistols ever made thanks to its prevalence in many films and games. 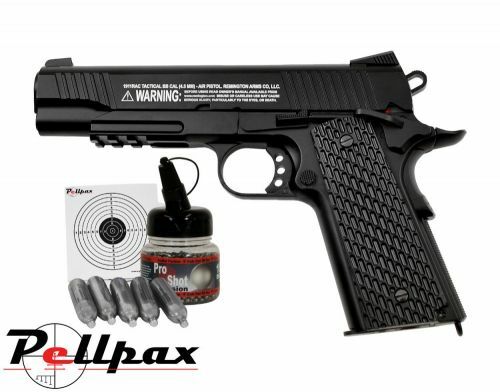 This tactical version of the 1911 is finished in black and features a weaver rail mounted under the barrel that is designed for lasers, torches and other attachments. This pistol utilises a full metal construction to add to the sense of realism and to make the pistol one of the most durable air pistols that Remington make. The magazine is also full metal and houses the CO2 capsule and the BBs reloading is quick and easy. All in all this kit includes the Pistol, BBs, CO2 and targets, everything you need to start shooting! Add this item to your basket & spend an extra £356.01 to apply for finance.